Best of the Valley Reader’s Choice Award Winner, Refine MD aesthetic medical spa in Menasha helps people look and feel younger, and more confident with a little help from BOTOX®. BOTOX® Cosmetic reduces fine lines and wrinkles. It’s a therapeutic muscle-relaxing agent that targets the muscles that cause wrinkles. The skin and persistent lines that develop over time smooth out when the muscle is relaxed. BOTOX® is a safe and effective treatment with no downtime. You can have a treatment at lunch time and head right back to work. BOTOX® Cosmetic treatments take approximately 10-20 minutes. The treatment is fast, simple and non surgical. BOTOX® keeps the muscles that cause lines relaxed for three to four months. Results are visible within 3-14 days after treatment. If you live or work in Menasha, Appleton, Neenah or the greater Fox Cities in Wisconsin and are interested in learning more about BOTOX®, please schedule a free consultation by calling us at 920-380-9990. BOTOX® Cosmetic primarily addresses lines in the skin known as “dynamic wrinkles,” which includes crow’s feet around the eyes and wrinkles visible while smiling, laughing or raising the eyebrows. These lines are normally less noticeable when your face is relaxed. This treatment may also be used for vertical bands in the neck as well as down-turning corners of the mouth. Candidates generally range from the ages of 25 to 70. Each patient is unique, however, so a one-on-one consultation is recommended to determine the best and most effective treatment plan. 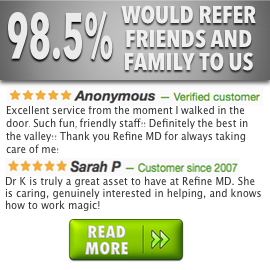 How do the physicians at Refine MD administer BOTOX® Cosmetic? Our doctors inject a small amount of BOTOX® Cosmetic with a fine needle into the targeted areas (for example: between the eye brows). The amount of liquid which enters the skin is very small, and patients experience only minimal discomfort in the form of a slight pinch. No anesthetic is necessary, and you can continue with your everyday activities immediately following the procedure. The injection needle is very small, which typically avoids any discomfort. The pinching sensation experienced lasts only a short time, and you will return to your usual activities without any painful aftereffects. Patients usually see the full effects three to fourteen days following the procedure, although this may be hastened by contracting the facial muscles. Results normally last for three to four months, and repeat treatments may result in longer-lasting effects. After three to four months, the effects begin to wear off and wrinkles reappear, though often not as deep or visible as they were prior to treatment. In order to sustain smooth skin and a youthful look, three to four injections are usually required. By returning for repeat treatments, fewer injections may be required in the future to maintain young-looking skin. No. Following treatment, patients usually return to their jobs and normal activities immediately. It is recommended, however, that you avoid exercise, heavy lifting and massaging the injected area for one to two days. BOTOX® Cosmetic is sold by the unit. The number of units required to treat each area varies from patient to patient. Your best option is come in for a free consultation to find out if you’re a good candidate and how many units you will need to achieve optimal results.